If you are a writer with an inventory of books, you already know that the first books out on Amazon are easily forgotten, with a new book being added every five minutes. Algorithms are slanted to make the new release stand out and have better rankings with its sales. I learned that with Desert Inferno, where a few years back, it had four sales in one month, which didn't bring it up in the rankings. So for books, out there over five years, that have fallen into Amazon's black hole, I've been looking into how to relaunch a book to get around the problem. There are books written on this. We bought one of them, and we'll see if it helps. One option that I don't like is pulling the book, making some minor changes, giving it a new title/cover, and presenting it as a new book. To me, it seems unfair to readers, could give the writer a bad name with them, but it's not hard to understand how some might do it. The books on the poster are the first ones I brought out as eBooks. They are contemporaries which I have long called, Romances with an Edge. They were written when I had limited interest in seeing them published. In the '90s, I did query a romance publisher on one or two of them, but the answers I received told me I'd have to change my basic plots and characters to satisfy what they felt a romance had to have to satisfy their readers. I didn't and don't disagree with them, but a writer has to also stay true to their muse. I am not sure what year Amazon began making it possible to independently publish books. It was 2011, when I decided I wanted to bring mine out that way. It took a year to get them ready. At that time, updating also involved recognizing societal changes-- a big one was the influence of cellphones and computers on communication. 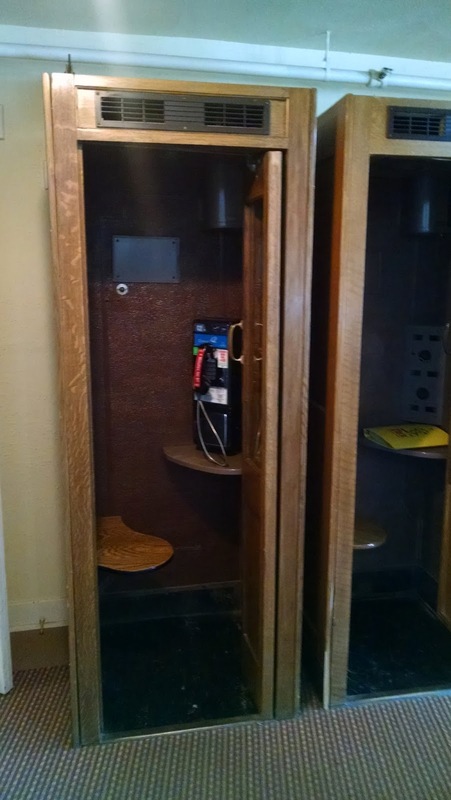 Are you old enough to remember payphones? They were a huge deal when away from home-- too often, their phone books would have been ripped (literally) off. There are not many of them left, but my characters used them in the '90s. When we recently stayed at Old Faithful Inn, there were these beautiful payphone booths. They were not a blast from the past, but there because much of Yellowstone National Park does not have cell phone coverage-- hence back to the old ways. The one contemporary that I didn't bring to 'modern' times was Luck of the Draw. Politically, it had to come when it was written in 1974, when a lot was changing in our culture. Even more importantly, to my story and its research, were the transitions in rodeo, where it was the end of an era and beginning of a new one. By keeping it an historical contemporary, I was able to add an epilogue thirty years in the future. I do not think it could have been brought to modern times given the character and plot. What I decided to do this summer was figure out when each of my contemporaries could have taken place. Regarding their plots, they could have been anytime, I preferred it be closer to today. In some, the second book had a date necessarily some years after earlier events. Other times, it was purely up to me. Since these stories have no political elements to them, I could do what I chose-- other than not wanting to use 2001 for obvious reasons. If you are writing, I suggest starting off with the year your story is set-- sometimes beginning the book with it on the left side. It saves hassle in later edits. These days, I make a calendar for the year I want and keep notes on the days for what happened when including sunrise and moonrise, etc. It's all online including historically. This all was particularly important for the paranormals where so much happens so fast, and it's easy to lose track. Luck of the Draw-- 1974: Bronc and bull rider, Billy, comes to Pendleton, Oregon, for the big roundup and a meeting that will change his life. Sara is facing her need to be independent at the same time she wants security. It's not secure to fall in love with a rodeo cowboy. Desert Inferno—2009: Landscape painter, Rachel O'Brian finds a body on her family's remote desert ranch and calls 911, When Jake Donovan arrives at the ranch, she sees in him the man she wants. Jake has an enemy who wants him too. Set in Nogales, the border country, Sedona, and Scottsdale. Evening Star—2008: When attorney, Marla Jamison, meets Randy O'Brian, she wants nothing to do with the younger, handsome cop. Randy has come to Portland with his own secrets. Bannister's Way—2014: David Bannister has been undercover before but when he reconnects with his artist wife, Raven, undercover takes on a whole new meaning. David was in Desert Inferno. 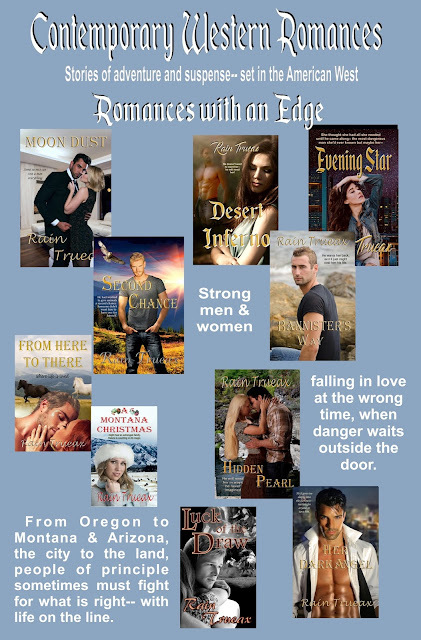 Hero and heroine from Evening Star are in this book. Moon Dust—2005: Susan, an interior designer, needs a divorce from her husband, Dane. The Portland high school principal is facing a deadly threat long with his heartbreak over a divorce he hadn't seen coming. Second Chance—2013: Psychologist Barrett Shaeffer juggles being a single mother, an invasive ex-husband and cannot afford more complications. Much younger, Judd Shipman, running a wildlife rehab center, as well as driving a truck, is not what she wants but might be what she needs. This book shares characters from Moon Dust. Hidden Pearl—2007: Builder, architect, S.T. Taggert needs to find his sister. He doesn't need the complications of photo-journalist, Christine Talbot, who has an assignment to photograph him as well as a religious leader who has dangerous intentions involving both of them. Her Dark Angel—2009: Katy Brown has come to Reno to help her uncle while his receptionist is out. Dillon Delaney is determined to make her visit a short one-- danger is in the air. Their love story takes them to Reno, Portland and Tahoe. From Here to There—2010: Helene Lamont knows she made a mistake in agreeing to marry Phillip Drummond. Too bad she didn't do something about it before the vows were said. She immediately seeks an annulment and heads for Uncle Amos' ranch in Montana. Phillip is angry, of course; then an invitation from Amos Hartz changes everything for them both. A Montana Christmas—2013: Can a family heal from years of dysfunction? Christmas may not be the easiest time to find out. Two years after From Here to There with shared characters and a continuing love story.